Borax is a great product with lots of uses around the house. The 20 Mule Team Borax brand has traditionally been used for laundry, cleaning and even for killing ants. Despite that long history, it's not always easy to find in stores. The laundry aisle at grocery stores and big-box stores, such as Wal-Mart. 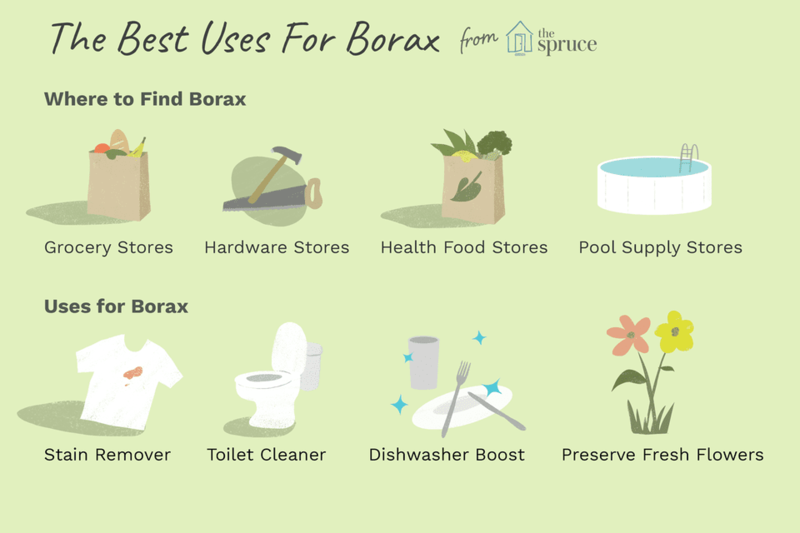 If you aren't able to find it locally, you can always buy Borax from Amazon. They sell it in small packages and in bulk. "20 Mule Team" is the borax brand that you're most likely to come across. It's sold in a white box with red lettering and touches of green. You may want to look at photos on Amazon.com, so you're familiar with what the box looks like before you head to the store. Be sure to look high and low on the shelf for it. That middle shelf space is usually reserved for the most popular detergents and laundry products, so you'll have to look carefully to spot the borax. But as more and more people turn to making their own cleaners and using natural products, it's becoming much easier to find. Borax, also known as sodium borate, sodium tetraborate or disodium tetraborate, is a naturally occurring mineral that is used in many commercial cleaning products. Borax is used in everything from toothpaste and cosmetics to laundry boosters and dishwasher detergents. It is sold in powder form and has a consistency that's similar to powdered laundry detergent. There are many household uses for borax. It can be used to create all sorts of natural cleaners, and when added to things like homemade laundry detergent or dishwasher detergent, it actually boosts the cleaning power of the other ingredients. Many homemade cleaners take advantage of its ability to soften hard water and whiten whites. Borax is also popular as a pesticide. Many people mix it with sugar and use it to kill ants and roaches. Knowing that it's used to kill bugs, it may seem more than a little crazy that kids are currently using borax to make homemade slime. Is this really a good idea? Experts say the small amount of borax called for in slime recipes is perfectly safe, as long as your kids don't eat it. So, if you have young kids who like to put things in their mouths, you may want to choose a slime recipe that doesn't include borax. That's also true if you think your kids might leave their slime out where pets could find it. Either way, you should definitely supervise your kids when they're making slime, and insist they wash their hands well after making or playing with slime. Wondering why borax appears in slime recipes, to begin with? It's the ingredient that's responsible for making the mixture thick and stretchy. But other ingredients can be used to achieve the same thing. Some recipes use contact lens solution instead of powdered borax. Lens solution still contains boric acid, but since it's not in a powdered form, you don't have to worry about your kids breathing it in while they work. Borax is a natural ingredient, but as we've already pointed out, it's still toxic if ingested. That means you should keep it out of reach of children and pets. If you use it to make your own products, be sure to label the containers with all the ingredients, just in case there's ever an accidental ingestion. You may know what's in your concoction, but other people in your household may not. Treat borax with the same care that you would any other cleaning product, and you shouldn't have any problems. In the late 1800s, borax was mined in Death Valley and transported across the Mojave Desert by teams of mules and horses to the railroad spur. That's where 20 Mule Team Borax gets its name. The company sponsored the television and radio show "Death Valley Days," from the 1930s through 1975. It was even hosted by Ronald Reagan in 1964-65. This made the name very familiar in those decades.